The National Court in Alotau last Thursday upheld a ‘no case submission’ by sitting Esa’ala Open MP Davis Steven over two counts of bribery in an election petition against him by losing candidate Glen Tobewa. The Minister for Justice & Attorney General had to step down from office for a week to attend to the trial matter, he was a relieved man after last week’s court decision by presiding judge Justice Terence Higgins. Higgins when handing down decision last Thursday, quipped there was inconsistencies describing witness accounts as “unsafe” to rely on- considering there were others financing them as well. The two counts of bribery both included allegations Davis had continued to deliver cheques to church groups in Esa’ala already into the election period. There was no proof they could furnish placing Davis in person at the scene of these allegations, Davis defense was that these were DDA responsibilities being carried out after he had stood down from office and had not necessarily been at his directions during this period. Davis’s lawyer Allan Baniyamai made a ‘no case submission’ which is “whereby a defendant seeks acquittal without having to present a defence"- this was up help by Higgins, dismissing the case. The court found that the petitioner’s evidence was insufficient on key elements concerned that the evidence was insufficient and unsafe to allow the respondent to answer the charges. The issue of costs in an application by Baniyamai will be argued in Waigani at a time to be set by the court. However, Mr Steven asked the court for costs on solicitor client basis. The court had heard via the petitioner’s witness accounts that their financier was another losing candidate in Jimmy Maladina. This is a new situation where the court would be asked for costs against a non-petitioner. In a twist, petitioner Glen Tobewa says he will take this matter up in an appeal to the Supreme Court. Tobewa had come 14th out of 16 candidates that contested the Esa'ala Open seat in the National General Elections 2017, we asked him what he hopes will come of this. “I just want people to know that it's not okay to use dubious, illegal means to win votes. It's unbecoming of a leader and I will prove to show this must not be repeated again in future. I could have scored good numbers in the elections had it not been for the actions I am fighting against". Steven in the meantime says he is relieved that the matter had been concluded so he could attend to his duties in the district as the MP representing his people of Esa’ala and as the Minister for Justice and Attorney-General to freely discharge the duties of the ministry. "Tobewa and financiers have proven they have deep pockets bringing in the queen's council from Australia for a trivial matter as such. I have no doubt they will want to take this further but I beg of them to respect the courts decision and most importantly, hold people's interest at heart. I am happy this has been concluded and I can get back to serving my people for now". This is Steven's second term as Member of Parliament and as a minister. From 2012-2017 term, he was the Minister for Civil Aviation and in this current Government as as Minister for Justice and Attorney-General. Pix1- Davis and lawyer Allan Baniyamai outside court house after decision. 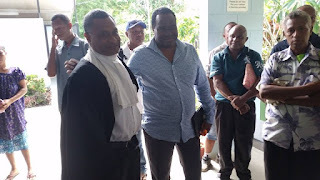 Pix2- Petitioner Glen Tobewa speaks to us at NBC Milne Bay, also after decision.